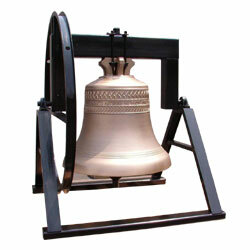 Are you searching for a Church Bells Company in Indianapolis Indiana? 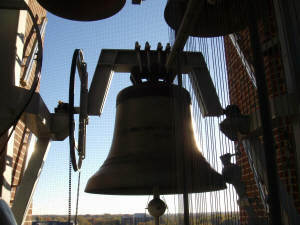 Smith Bell and Clock Service provides nationwide Church Bell Provisioning and service to our clients in Indianapolis as well as clients all over the USA. Church Bells have been a mainstay for communities all over the world for centuries. At the turn of the 19th century, more and more bell foundries began and made it commonplace to find cast bronze bells prominent in Churches, Cities, and other Municipal Places. Whether your looking to enhance your bells looks, a new bell, provide a lasting solution to an old bell, or locate a used bell. We can help. We can also provide bell wheels. (Wooden or Steel) Electric Swing motors, Electromagnetic Strikers, Bell Controllers, and more. Get your bell(s) tolling, swinging, or striking the hour again today! We try to encourage our customers to participate in our annual or semi-annual maintenance program. It is very affordable. Proper maintenance of your equipment is crucial in improving the life of it. Also, we are able to save Universities, Churches, and courthourses a significant amount of money because we can often forsee potential problems and head them off before they become a major problem. If you have been searching for a church bells company in Indianapolis IN that is experienced and knowledgable, your search ends here. Call us today at 317-847-4092.